Expand your job to include others’ responsibilities? Feel taken advantage of as credit for your work goes to others? Consistently helps others get ahead? When is it going to be your turn? Being a good person doesn’t have to be a competitive disadvantage. Why struggle when in less than two hours you can learn how to communicate your value without “beating your chest”? 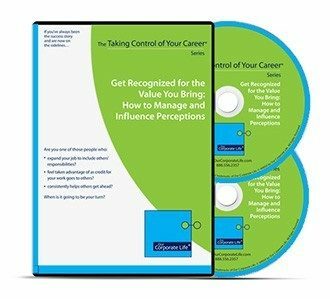 Listen in and learn from executives as they learn how to align perceptions of influencers while remaining true to themselves. I expect that even if I don’t follow this advice to the letter, the concepts will be a tiny voice in my head, filtering my experiences and guiding by behavior. I already put some of these ideas into practice in a strategy meeting I had been dreading – specifically, taking things less personally, offering proactive approaches, and owning the value of my work… and left the room feeling energized to kick off this new project. Just one example of the practical steps I am now taking. I already put some of these ideas into practice in a strategy meeting I had been dreading... [I] left the room feeling energized to kick off this new project. I’m already seeing results from taking small steps.